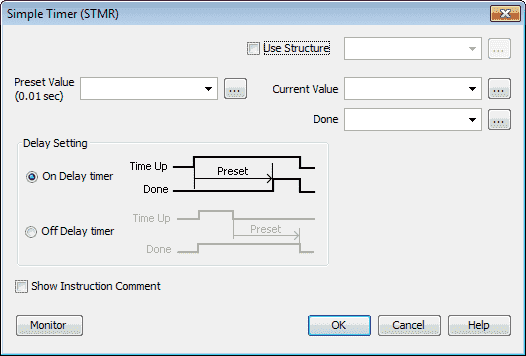 We will now look at using the Simple Timer (STMR) and the Timer (TMR) instructions in the productivity suite software. Let’s get started. 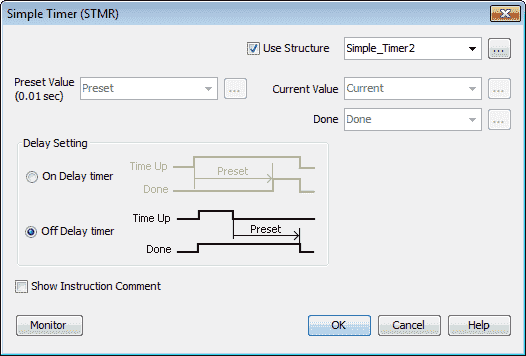 We will first use the simple timer as an On Delay timer. The addresses can be entered individually or through the Structure. 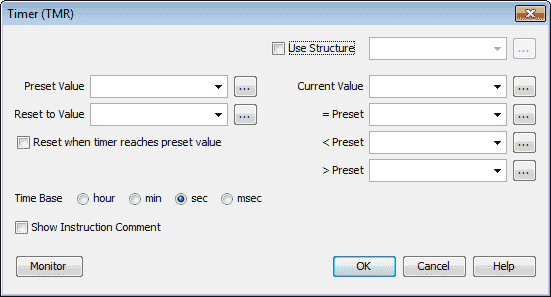 Using the structure, the preset value, current value and done bit are automatically. 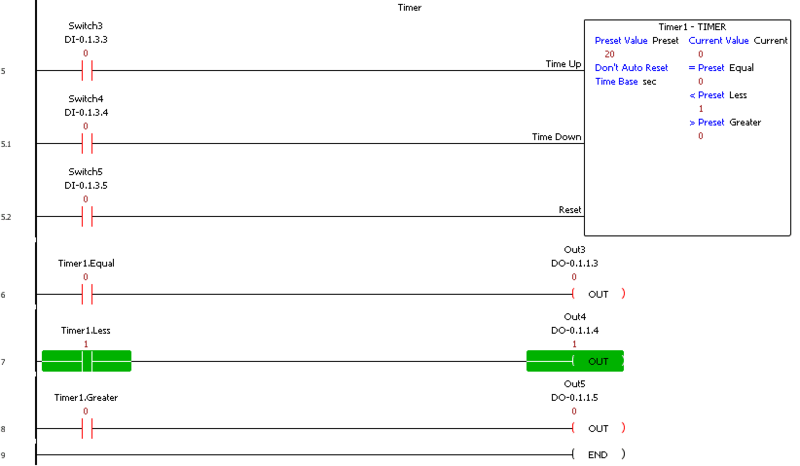 When the rung condition is on with switch 1 the timer will start to time. 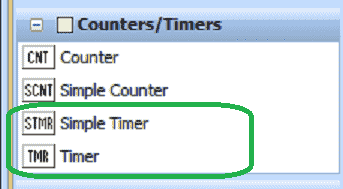 After the time (10 seconds) has expired the output bit (Simple_Timer1.Done) will turn on. The second rung of your ladder will turn on Out1 when the Done bit is on. 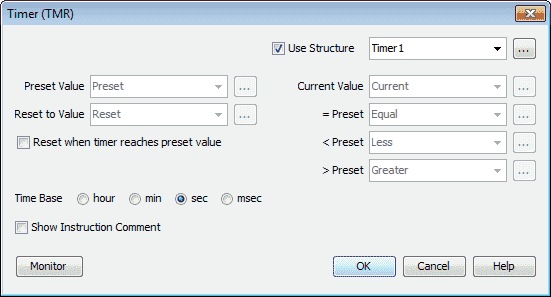 Our off delay timer will turn off the output done bit after the time set has expired. See the above timing chart. We will use the structure named Simple_Timer2. When our rung input (Switch 2) turns off, the output (Simple_Timer2.Done) will remain on until the timer (10.00 seconds) expires. The second rung will then control the Out2 bit from the timer done bit. 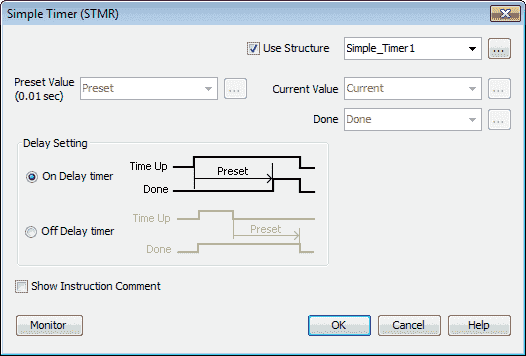 We will use the structure name of Timer1. The Time Base will be set for seconds (sec). The following tags will now be defined. We will make the preset, reset and current ones memory retentive. The preset value will be set for 20. This represents 20 seconds for our timer. Our first input (Switch3) will be the time up. When this is on the timer will time up at the time base rate we selected above. The second input (Switch4) will be the time down. When this is on the timer will time down at the time base rate. When both time up and time down inputs are on at the same time the timer will not count. The reset input will be done with Switch5. When this is activated the reset value will be placed in the current value. 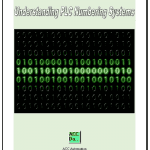 Watch the video below to see the timer instructions used in our Productivity 1000 Series PLC. 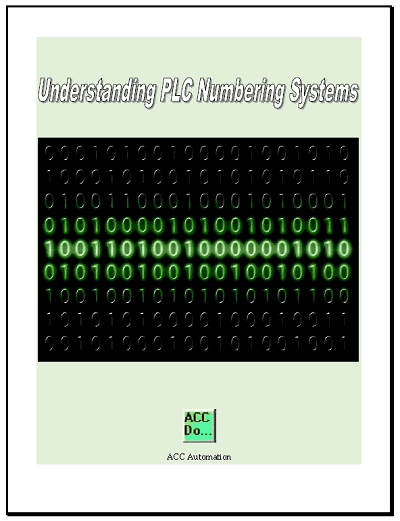 Next time we will look at counter instructions in the Productivity 1000 Series PLC.